Does Obama really lack cool phones? "I always thought I was gonna have like really cool phones and stuff," he said during a Q&A session with contributors at a fund-raising meeting in Chicago on April 14, 2011. "We can't get our phones to work." Acting out his exasperation, he said: "Come on, guys. I'm the president of the United States! Where's the fancy buttons and stuff and the big screen comes up? It doesn't happen." Obama made these remarks after the press pool had left and may not have realized some reporters back at the White House could still hear his comments. The president was probably responding to a question about bottlenecks in technological innovation and he used his White House experience as an example. A lot of people would probably like to believe these remarks of the president, symbolizing the outdated state of the federal government. But in fact, what Obama said, isn't quite true. 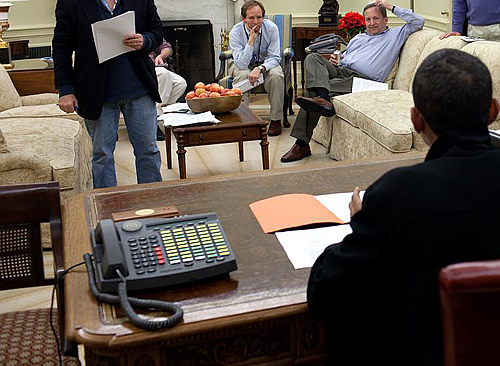 In 2006-2007 president George W. Bush had the White House Situation Room completely renovated, providing it with state-of-the-art communications facilities. Since then the real Situation Room has all the phones and videoscreens and other stuff, which was before only seen in movies. The IST-2 was installed in the White House in 2007. It's a phone specially designed for the US Defense Red Switch Network (DRSN), which connects the president and the Pentagon with all major military command centers. These new phones were part of an upgrade of the communications system, which became necessary after some serious communication problems occured during the 9/11 attacks. Therefore, the problems caused by outdated equipment should have been solved under president Bush. This would leave nothing to complain about for Obama anymore. 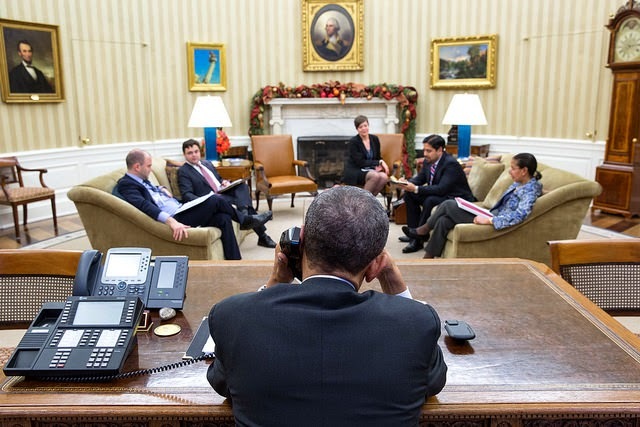 Now we see a Cisco 7975G Unified IP Phone (with expansion module 7916) behind a Avaya/Lucent 8520T on Obama's desk. This Lucent phone is from the most widely used business phone series worldwide, but is dating back to the mid-nineties. The Cisco 7975G is a VoIP (Voice over IP) telephone, and as such also one of the most widely used. This series, which was broadcasted between 2001 and 2010, shaped people's imagination of the presidency and was in many ways a forerunner of reality. For example there was a popular black president (David Palmer) years before Obama was elected, and much of the fancy communications equipment from the series, like video teleconferencing, was implemented in the real White House Situation Room in 2007. 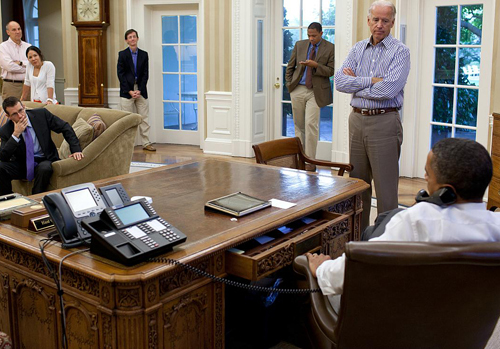 And now the real president also has the same cool Cisco phone as the heroes used in the tv-series. which means the equipment, from past and present, that makes that civilian and military leaders can safely communicate. The main focus will be on the United States and its National Security Agency (NSA), but attention will also be paid to other countries, like Germany and the Netherlands. Any comments, additions, corrections, questions or suggestions will be very appreciated! There's no login or registration required for commenting. The postings on this weblog are updated frequently as new information about the NSA is still being revealed. Therefore, revisit this weblog and check the articles for updates! Section 702 FAA expires: what are the problems with PRISM and Upstream? "years of the most fascinating overviews of government security practices, and even-handed reviews of Snowden docs." "It's actually straight up interesting but also weird how weirdly, wonderfully detailed this blog about hyper secure communications is." "Consistently interesting (and strangely, calming/uplifting) content"
Sequence of the real Red Phones, not for the Washington-Moscow Hotline, but for the US Defense Red Switch Network (DRSN). The phones shown here were in use from the early eighties up to the present day and most of them were made by Electrospace Systems Inc. They will be discussed on this weblog later. These color codes are used to mark the classification level of (digital) documents and files and also of the communication devices used for their transmission. The title picture of this weblog shows the watch floor of the NSA's National Security Operations Center (NSOC) in 2006. The URL of this weblog recalls Electrospace Systems Inc., the company which made most of the top level communications equipment for the US Government. All information on this weblog is obtained from unclassified or publicly available sources.